Why consider installing a Geothermal heating, cooling and hot water system? Compared to ordinary furnaces and air conditioners, a Water Furnace can provide energy savings of up to 70%. 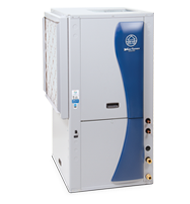 (WaterFurnace is a leading manufacturer of geothermal systems that both heat and cool homes). Very popular in local communities such as Manotick, Greely, Kars and Kemptville. The most efficient gas furnaces today deliver 98% of the energy that they are supplied with, geothermal systems deliver an efficiency that translates to 500% because additional "free" energy is extracted from the ground. Earth loops can be horizontal, vertical or coiled in ponds or lakes. In certain instances open loops can utilize well water. For a personalized estimate of how much you can save try our Geothermal savings estimator remember, payback is often achieved within a few years. The ultimate Environmentally Friendly solution. The ground absorbs 47% of the sun's energy and geothermal systems harness that energy to heat and cool your home. Installing a geothermal system is the environmental equivalent of planting 750 trees or removing 2 cars from the road every year. RB Heating ClimateCare has more than 2 decades of experience in Geothermal systems, and have installed and serviced hundreds of systems in Ontario, specializing in Manotick, Greely, Kars and Kemptville and surrounding area. Why not give one of our experts a call and see if geothermal heating and cooling is an option for your home or business. Save Money. Environmentally Friendly. A more Comfortable Home! Geothermal systems installation and service as far afield as Greely Manotick, Brockville, Smiths Falls and of course Kemptville. As the upgrade to our highly successful Envision Series, the 5 Series represents some of our best features and efficiencies yet. The 500A11 provides forced air heating, air conditioning, and even generates a portion of your home’s hot water – all from a single unit that offers a level of comfort and savings that’s far greater than any ordinary system. Available in many sizes and configurations, the 500A11 provides exceptional performance, versatility, and quiet operation. All 5 Series products utilize environmentally friendly R-410A refrigerant and the best in system components, including all-the next generation of WaterFurnace controls – Aurora. Aurora controls provide two-way communication between components for the ultimate in performance and troubleshooting capabilities. 500A11 units also feature an all aluminum air coil for durability and extended system life. The 5 Series upholds the standards we’ve set over three decades and the trust associated with the WaterFurnace name. Every unit is computer run-tested to ensure flawless performance at start-up – and in the unlikely event of a malfunction, they’re backed by the best warranties in the industry. Choose a geothermal system that’s Smarter from the Ground Up.